Bermuda has built its economy on offshore finance, insurance and tourism, but the overseas territory is making a concerted effort to move into new areas, including blockchain and cryptocurrencies, reports Nick Martindale for economia. If you mention Bermuda to most people, chances are they will either think of its famous pink-sand beaches or its reputation as a centre for offshore finance. While both elements are part of the make-up of the British Overseas Territory in the North Atlantic, they do not tell the full story. Bermuda has built its economy on the insurance industry, and is increasingly moving towards emerging markets such as fintech and cybercurrency. International business based around the insurance sector, supported by leading law firms, company administrators, actuarial consultancies and accountants, is the largest element of the island’s economy today, says John Johnston, CEO of Deloitte in Bermuda and the Caribbean region. “The Bermudian model has largely been one of innovation to solve business needs, and responding to opportunities in a way that other jurisdictions haven’t been able to do,” he says. “The development of the captive insurance business here about 50 years ago is a good example of that; a captive can solve a fundamental risk management issue for a company in a way that is well regulated, efficient and more economical than laying off risk directly to the commercial market.” More recently, the island has also become a base for reinsurance and insurance-linked securities businesses, with commercial insurers and private equity firms attracted by the favourable regulatory environment. The offshore finance element of the economy remains, as a base for hedge funds and trusts investing money for private clients. “Bermuda has been in that space since the 1970s when the first hedge funds started coming into focus,” says Johnston. “We have about 800 funds on the register with the regulator. Currently, the island is the UK’s only overseas territory able to refuse to accept the ruling of the UK parliamentary vote requiring compulsory public disclosure of corporate beneficial ownership, which has prompted concerns that this may give it an unfair advantage over other territories. Burt denies this, stressing the island has held a central register of beneficial ownership for more than 70 years. The economy is in a period of growth, after years of decline in the wake of the global downturn, which hit Bermuda later than many other economies. Oxford Economics forecasts GDP growth of 1.9% in 2018 on the back of 1.7% the year before, with investment expected to rise by 9%. 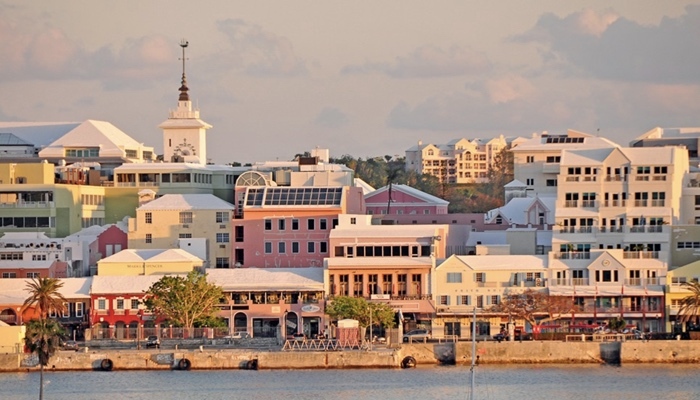 S&P Global Ratings recently upgraded its outlook on Bermuda to “positive” and also affirmed its A+ long-term sovereign credit and senior unsecured debt ratings. The government recently introduced the landmark Companies and Limited Liability Company (Initial Coin Offering) Act and the Virtual Currency Business Act, which provide the world’s first cryptocurrency regulation, in a bid to encourage more firms to base themselves on the island. Bermuda also recently signed a memorandum of understanding with Medici Ventures, which will see the island become a base for its laboratory for leading-edge blockchain innovations, creating at least 30 jobs over three years. Despite the generally favourable economic outlook and its newfound markets, there are challenges for the Bermudian economy. Johnston identifies a downward pressure on insurance and reinsurance rates as one concern, compounded by the impact of global delivery centres which has seen some international firms move jobs away from Bermuda. He also points to a high level of public debt as a longer-term concern, as well as the island’s immigration system, which he believes needs urgent reform to ensure the territory remains attractive for international businesses. For Burt, a bigger issue is to make sure the benefits of any economic growth are felt by local people on the island, including developing skills and ensuring people can afford to get on the housing ladder. With its enviable climate and attractive tax regime – with zero income or capital gains tax – Bermuda can be an appealing destination for accountants looking for a fresh challenge. Thomas Burton, Managing Director of Hamilton Recruitment, worked in the United Kingdom and Bermuda for Deloitte before moving to work in the island’s insurance management sector, eventually going on to start his own recruitment firm placing accounting and legal professionals on the island. “You can get great financial services experience that you may not get in other parts of the UK, outside London or Edinburgh,” he says. “We tend to find that one of the selling points is that it gives you a second bite of the apple. You’ll get experience on cutting-edge financial products such as insurance or hedge funds in an international reporting environment, often working for US clients.” Many people choose to stay on the island for a few years before returning to the UK, or heading to New York or Chicago”, he adds. While there is a strong emphasis on developing local talent, there is still a need for overseas accountants, adds John Johnston, CEO of Deloitte in Bermuda and the Caribbean region. “In Deloitte alone in Bermuda, we have accountants from 16 different countries,” he says.